The new Ultravid line of binoculars have significant improvements over the existing Trinovids, all of which will be welcomed! The Ultravid Compacts replace the 10 year old Trinovid compacts. 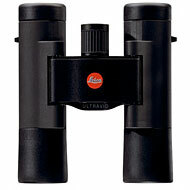 The newly designed compact binoculars are the LEICA ULTRAVID 8X20 BR/BL and 10x25 BR/BL. These new models with sharper, brighter and more contrasty optics are also fully watertight and nitrogen filled. Each size will be offered with rubber armouring (BR) or leather styled coverings (BL), and have a larger redesigned focusing wheel, with improved ocular adjustment.